This is my 4th card (1 more to go) for my girlfriends. 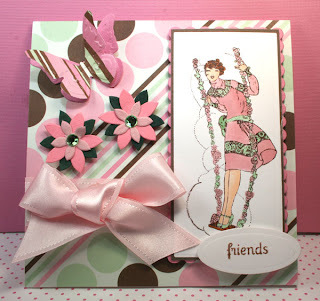 I loved this Glamour Girl Stamp Set (can you tell)! There are just so many possibilities with the set. I am doing all my cards in pink so I thought this paper was just perfect. I have had it quite a while, just waiting for the right moment to use it. Because the paper is so busy, I did not add any contrasting paper to it. I thought it stood alone quite well. I have popped everything up with some dimensionals and I cut two butterflies with my Spell Binders die and layered them for extra dimension. Joan, this card is fabulous! Oh, I love what you're doing with this set. So many gorgeous designs! Yes we had snow and it is still on the ground. It is supposed to be warming up this weekend so maybe get outside and finish the gardening. Let's go do this together some day! This was once, one of my favorite girly activities!! Wheeeeeeeee! I really love this one - it is all around just so fun, light-hearted and happy!! !